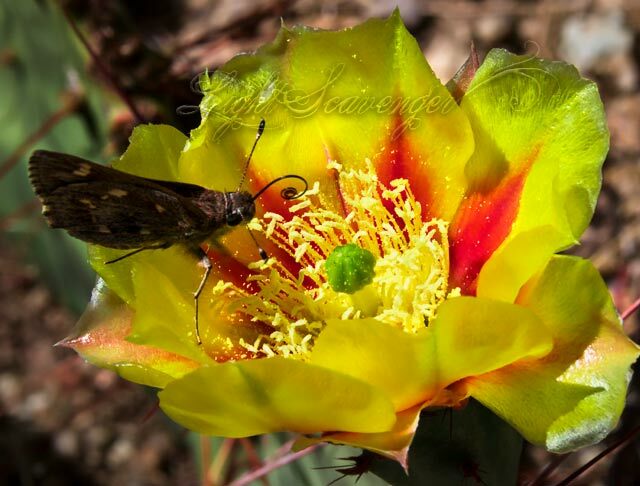 I saw some prickly pear blossoms with red-orange centers last year and have been eagerly keeping an eye on their location, hoping to see more this year. Alas, there’ve been only a handful of buds, and no flowers yet. So you can imagine how completely thrilled I was last week when I saw this single blossom in a totally different place. I sat down to take some photos (it was pretty close to the ground) and in the 10 minutes I spent there, all sorts of pollinators came to visit. One was this skipper butterfly (a duskywing, maybe?). For whatever reason, I was completely charmed by the spiral its proboscis created.